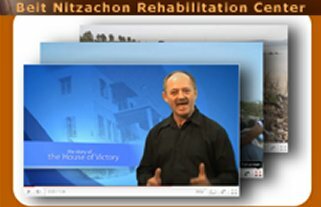 Beit Nitzachon (House of Victory), located in the city of Haifa on Mount Carmel, is Israel's first Bible-based rehabilitation center. Founded by David and Karen Davis in 1991 after the first Gulf War, the vision for this ministry is the "one new man" in Messiah of Ephesians 2:14-16. Many Jews and Arabs have been delivered from life-controlling problems and have found new life through the word of God and the power of the Holy Spirit. Marriages and families have been restored. Many graduates of House of Victory are now leading productive lives, and some are also ministering to other afflicted individuals in Israel. The program is based on the parable of the Good Samaritan (Luke 10:30-37) and Isaiah 58:7: "Is it not to share your bread with the hungry, and that you bring to your house the poor who are cast out; when you see the naked, that you cover him, and not hide yourself from your own flesh?"